It’s been a long time coming for Sentosa - the offshore island finally having caught a break these past few days as the island's marauding history is suddenly being brought up all across the world’s media outlets. As the second largest of all of the 63 islands in Singapore, Sentosa is perhaps the most famous (excluding the mainland of course) out of the lot. From warrior spirits to treacherous tales of piracy and disease, the island, once known as ‘Pulau Blakang Mati’ or ‘Island of Death from Behind’, has seen it all. The mastermind behind the recent foiled 'rocket attack' on Marina Bay was also once a person who worked on Sentosa. Talk about homegrown terrorism huh? Not to be outdone, Singapore's other islands, Pulau Brani, Lazarus Island and the Kusu and Sister islands amongst others are all similarly tied to legends stemming from the Riau or Java kingdoms. Its strategic location has always garnered attention from the powers that be. Once an artillery battery housing the centrepiece of the British Fortress Singapore strategy, it was also home to the forts of Serapong, Connaught, and Siloso. After its rezoning as a tourist getaway, this ‘impregnable fortress’ saw its military installations converted into museums while the rest of the island was developed for hotels and leisure attractions. Yet, it was only until recently that visitor numbers to the island picked up. For one, the island was only zoned for tourist activities in 1972 and only got a monorail service a full decade after. The Sentosa Boardwalk that most locals are familiar with today opened a short 7 years ago. The name Pulau Blakang Mati appears to have taken center stage in the media coverage about Sentosa. But what exactly are the etymological origins of such a grim moniker? Some believe that it has something to do with the island’s past history of murder and piracy as the sea lanes around Singapore have always been one of the most valuable in the world due to trade between the East and the West. Considering that Singapore was a British crown colony, it's not hard to see why pillaging any of the ships bound for Singapore wouldn't have been considered lucrative for pirates. Indeed, many merchant ships anchored in the relatively calm waters between Pulau Blakang Mati and the mainland. Others point to its reputation as having been a playing ground for ‘warrior spirits’, who are purported to live on Pulau Brani but moved to Sentosa for recreation and to ‘find themselves’. Perhaps tourism really is the world’s oldest (and transcendental) industry. Although the name likely existed before the 19th century, the island has certainly lived up to its reputation. In the late 1840s, a wave of malaria killed many of the indigenous Bugis settlers living on the island and as well as a few British signal officers. The idea of 'mati', or death, is also a particularly apt descriptor of Singapore ('the island behind') as a whole as it went through a period of murderous killings and oppression during the Japanese Occupation. Not only is it popular knowledge that the British artillery batteries on Fort Siloso were pointed southwards and did little to save Singapore from the eventual Japanese invasion from the north, Sentosa was also the site of a prisoner of war camp and a staging ground for the Japanese operation of Sook Ching (killing of suspected resistance members). The folly of the first point, by the way, lies not in the battery’s physical inability to point towards Malaya, but in the fact that it was meant to shoot armor piercing rounds at ships - hence being completely ineffective against land forces. The British tried to rid the island of its grim name and terrible reputation back in the 1820s but it would prove to be wholly uninhabitable and dangerous, as the events of 1840 would come to prove. The name was ultimately shelved due to the greater ease of expanding northwards on the mainland as opposed to linking St George’s namesake to the mainland. It would take another 4 decades for the British to finally return to the island, building a series of military forts and coastal batteries. Pulau Panjang or ‘Long Island’ is also a name that isn’t really descriptive of the island at all. If anything, it’s a joke compared to the real Long Island in the state of New York. Other names like Burne Beard Island, Pulau Niry, Nirifa have also been used to desribe the islands during the heady days of Asian merchantilism and European exploration (read: colonisation). 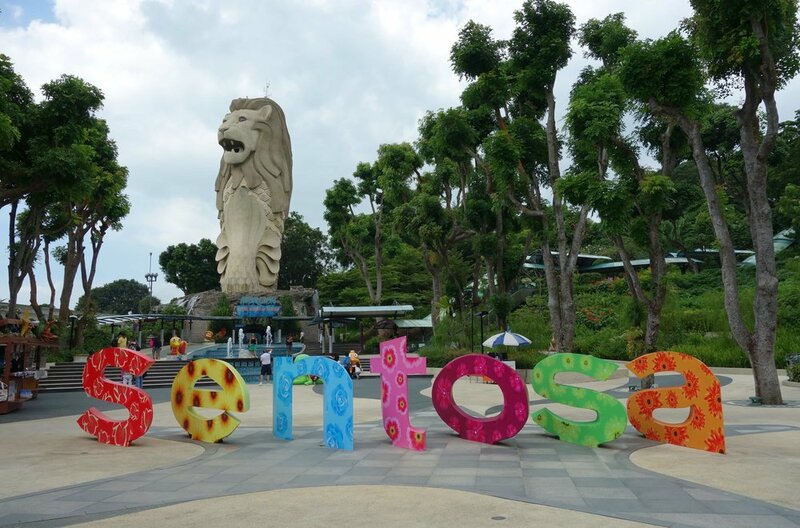 Sentosa - The State of Fun? 'Sentosa' means peace and tranquility in Sanskrit, a pretty proper name unlike the many other names in Singapore that don’t really have any meaning or proper etymological origins. Yet, few know of the alternative plans that were conceived for Sentosa before its current incarnation as an island wide tourist trap. Indeed, Sentosa was almost home to Singapore’s petroleum refineries. The plan for the petrochemical complex however, was shelved at the behest of Albert Winsemius (Singapore’s first economic advisor) and the head of the Urban Renewal Department (now URA), Alan Choe. The prevailing argument of the day was that a petrochemical complex would ruin the island and the adjacent parts of mainland Singapore’s coast due to pollution. Even fewer might know about how much the government of Singapore has invested into cultivating the name of Sentosa. With the decision in 1972 to turn it into a tourist hotspot, the government contracted the Dillingham Overseas Corporation to draw up a master plan for the island. This was passed as the Sentosa Development Corporation bill within the same year. At present, the Sentosa of today boasts a complete Integrated Resort Complex (a Resorts World no less), a Sentosa - Universal Studios theme park, two golf courses and a Casino. Sentosa's beaches are also fully accessible. There’s also a Madame Tussauds and a Luge attraction. All of this in an island that’s less than 5 square kilometres in size. It's clear that the island was conceived of as a complete family holiday destination as Sentosa always has things to do (especially for kids) no matter what your inclinations or persuasions may be. Youngins know the island for its Universal Studios, as a venue for the annual ZoukOut, as well as the de facto location for school/college orientation activities. The beachfront Prive and Tanjong Beach Club are also fairly pleasant locales that are perfect to lounge a weekend away. Apart from that, most locals don’t see much of a need to visit the island. Getting to the island without sweating is also going to cost you. Not only does the ‘Sentosa Express’ monorail move at a (at best) laughable pace and is priced at $4 (seriously? ), the island’s cable car service (that no one uses) costs an extortionate $30. There's also something called the Sentosa Islander membership that pretty much nobody has - the less we talk about Sentosa's exorbitantly priced hotels (except maybe the Costa Sands) the better. Since then, significant efforts at maintaining the natural assets and heritage of the island have continued. The name has also been registered as a trademark in countries like Malaysia, Indonesia and China - worth millions of dollars. It was only in recent years when Resorts World Sentosa and Universal Studios opened that Sentosa has seen commercial success. Many older Singaporeans would know just how unattractive of a destination it was considering its subpar attractions and the relative difficulty of getting onto the island. Entrance fees for both the island and its attractions were high. Sentosa's old attractions also left much to be desired after a series of accidents occured on the island. For one, the water park called Fantasy Island which opened in 1994 - to the tune of $54 million - was engulfed in negative press after many were hurt and 2 deaths occured. It closed surreptitiously in 2002. The Singapore Cable Car Disaster of 1983 also tarnished the reputation of the island after an oil rig passed under the aerial ropeway and snapped the cable. Immediately, two cars and the 7 people in them were sent plummeting into the sea. A further 13 others were trapped as a result of the incident. Guess who was in charge of the Singapore Armed Forces’ rescue effort. Sentosa has been many things - a pirate haven, a hotspot for malaria and even a WW2 internment centre. However, for the next few days, it’ll be one of the most important places in the world. The Trump-Kim summit, which kickstarted the renewed interest in the island, is slated to be held in the Capella Hotel. Designed by the distinguished architect Sir Norman Foster, the Capella comprises two colonial buildings (the main one connected to a sprawling curved structure) and a complex of private villas. The site of the hotel was once used to accommodate the British Officers of the Royal Artillery. Nowadays, apart from tourists, peacocks sometimes roam the hotel grounds of the Capella - a fitting representation of the larger than life characters of the two leaders. In a tastefully executed interpretation of East meets West, the Capella seems like the perfect venue for the summit. The Contemporary Manor where the meeting is likely to be held in is definitely not as iconic as the Blue Room (the ones in Panmunjom) but any visitor would fall head over heels over its beauty. Capella’s distance (read: ‘secluded’) from the main hotels and attractions of the island would also allow authorities to restrict access to the hotel and its surroundings. The ability to block the causeway is also said to be one of the strong suits of the argument to have the summit in Sentosa. This is also probably why many of the country’s most exclusive and expensive properties are also located on the island in a development known as Sentosa Cove. During the course of the summit, US President Donald Trump will be staying at the Shangri-La whilst Kim Jong Un is expected to call on the St Regis. These are, unsurprisingly, properties on the same plane of luxury as the Capella and are both highly regarded hotels. Singapore also hosted a summit between Chinese President Xi Jinping and Taiwnese President Ma Ying-jeou back in 2015, another landmark meeting between two countries in dispute. Leaders of the PRC and ROC had not met since the Kuomintang fled the mainland back in 1950. For this meeting, topics pertaining to denuclearisation and an end to the Korean War are all on the table. The landmark importance of such a meeting has prompted the Singaporean government to designate large parts of the island as a special security zone. Any actions within this area that could cause undue attention like loud hailers, sounds systems and weapons are banned, with the police possessing wide ranging powers to search and detain. As you can see, Sentosa is more than just its old time (and not to mention outdated) moniker - it now houses many of the world's most expensive hotels and resorts. Come June 12, it'll also host a meeting that might finally bridge a gap between two very belligerent powers, and even end a decades long war. And no, we're not talking about those warrior spirits. Love what you're reading? Follow us on Facebook to keep up with all of our articles on all things related to travel.